Edward Oakley Thorp was born in 1932 in Chicago. A master in Physics and doctorate in Mathematics, Thorp was teaching the MIT ream members, when he encountered an article about gambling which pushed him to studying the mathematical probabilities of winning in casino games. The results of his research were impressive even for himself, and he discovered interesting regular occurrences in the game of blackjack, which made him explore it more closely. The matter is that in all casino gambling games, except for blackjack, the events that occurred in the past have no influence on the events that are going to happen in the future. 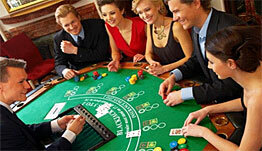 In other words, all casino games except blackjack were considered as pure luck and nothing more. Blackjack is different. The cards which are dealt while playing are discarded, and cannot be dealt to in the next rounds. So, according to the theory of probability, definite cards are more likely to be dealt to the player or dealer in next rounds. Edward Thorp spent a great amount of time with IBM calculating machine, which counted the probabilities of stand, hit, double down or split actions based on what cards were already dealt to, the dealer's up card and the player's cards. The aim of the whole concept was no to win every hand, but to increase your bet when the chances are bent to you and to decrease it when the chances are low, the principles which were used in full measure by legendary MIT blackjack team, about which you'll know a bit later. Long research and huge amount of work resulted in the book called "Beat the Dealer", 1962. The book became tremendously popular and a bestseller in the gambling world, and Edward Thorp became a man who was feared at betting houses because he gave a push to the interest of blackjack and card counting in general, which resulted in wave of losing money in casinos where came people who read the book and made right conclusions out of it. It should be mentioned that Edward Thorp was not the first man to invent card counting, but he was the first who systemized the subject and show a mathematical reason and base why card counting is generally possible. After his success in casino games Thorp moved to Wall Street - where he used in full measure his mathematical genius to foresee the price anomalies and with his partner J. Regan developed simple and efficient method of earning money on stock. His methods are shown brilliantly in the book called "Beat the Market", 1967. All in all, Edward O. Thorp is a legendary blackjack player and thinker, and is one of the 7 people elected to be original members of Blackjack Hall of Fame.